A new mixed-used town center that I frequent was featured in the NYT. Thought I’d pass along so those who are interested can get a sense of life inside (or in this case barely outside) the beltway. My home is about 10 minutes from here. With the new HOT (High Occupancy Toll) lanes on the beltway, it’s about 3 mins and 30 cents. Or free if the whole entire family is in the car. If the development continues, it will be accessible by bicycle. Too much traffic for that now. The story neglects the best part of the movie theater: the full service bar. We considered the town homes that are for sale, but decided to stick with our home. A little uplifting reading for you. It’s long but covers Americans’ increasing indifference to our institutions — government, churches, corporations, etc. I wrote a fatalistic comment yesterday that the only people who can save the economy of the US is the middle class. We’re the only substantial enough population to do it. In general, the uber wealthy have been fighting tooth and nail to protect their wealth. I believe it’s a little like cutting off their nose to spite their face but as someone who has never amassed great sums of wealth maybe I just don’t understand that need. I was born into the middle class and managed to hang onto that while putting five kids through college and living a well adjusted and happy life so I don’t think I’d want to trade places with them. Amassing huge sums of wealth was never a particular desire or fantasy for us. I’m in favor of protecting the safety net but realize and accept that changes are coming which really means that myself and my friends will be spending more time in the trenches helping where we can to bridge the difference between minimal subsistence and something worse. Okay. I accept the fact that my grandchildren will have larger classes and more trouble finding colleges their parents can afford or that will accept them based on the need surpassing the availability. Luckily they’re smart kids and so are their parents, I’m pretty sure they’ll figure it out. There may not be as many manufacturing jobs for high school graduates but we still need plumbers and restaurant workers and eventually the construction industry will come back. 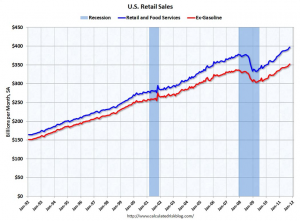 And guess what the American consumer is already coming back, we’re spending our savings to do it, and Europe may bring us down yet, but for now demand is back. Good for us, we’re the heart of America. It’s not even a left right issue, it’s as American as apple pie. Lots of good charts and cautionary tales at the link but I’m trying to look on the bright side. Personal income growth is running at about 2% a year at best. Note as well that personal savings have begun to fall. Outside of cars and student loans, consumer credit has fallen in the last three months so I conclude that the current round of consumption is funded largely from a savings rundown, following the big spike post GFC. We’ve been here before, of course, and such cycles can run for longer than anyone expects so we can’t discount that possibility. Not to beat a dead horse from yesterday and again today, but here are a few pics from the “We are the 99%” OWS “radicals”, not from the protest signs, but the messages they really want heard. I’m enjoying watching people, especially young ones, finally get up and express their fears, anger and solidarity with one another in an attempt to change their future. I’m an old softie, I admit it, so I found some of these messages of personal misfortune very poignant. I missed this from earlier in the week. Tens of millions of U.S. citizens remain burdened with mortgages they can no longer afford, in addition to soaring credit card bills and sky high student loans. Trillions of dollars in outstanding consumer debt is stifling demand for goods and services and that’s one reason economists say cash-rich U.S. companies are reluctant to hire and unemployment remains stubbornly high. In an August appearance on CNBC, Roach said debt forgiveness would help consumers get through “the pain of deleveraging sooner rather than later.” But it’s not just the liberal economists and doom-and-gloom financial analysts calling for a great haircut. Even some institutional investors, who might suffer some of the impact of debt reductions on their portfolios, are seeing a need for a creative solution to the mess. “If there is something constructive that can be done it should be,” said Ash Williams, executive director of the Florida State Board of Administration, which oversees $145 billion in public investments and pension money. “You don’t want to reward bad behavior and you don’t want to reward people who were irresponsible. But if there is a way to do well by doing good, then let’s take a look at it.” To be sure, consumer debt levels have been coming down since the crisis began. Here are a couple of interesting reads from Tom Engelhardt and Andy Kroll over at TomDispatch (just one of those financially esoteric economic blogs I enjoy reading). I’m apologizing in advance for only really caring about health care and the economy. I’m an old political activist who cut her teeth in the 60’s and while I care about and participate in politics, I am very cynical regarding the political landscape and so I tend to keep my posts focused on areas of my greatest concern. I did notice though that Obama seems to be channeling Harry Truman lately.